With National Park Service’s birthday coming up on August 25th (one of the days the National Park Service waives it’s entrance fees), this is a great time of year to plan a visit to any of our national parks! Summer also makes it a great time to check out Wrangell-St. Elias National Park, America’s largest national park and a United Nations World Heritage site, in the gorgeous state of Alaska. Larger than Switzerland and just slightly smaller than West Virginia, Wrangell-St Elias comes in at an impressive 13.2 million acres, boasting 9 of the 16 highest mountain peaks in the United States. One of the parks glaciers alone, Malaspina, is larger than Rhode Island. 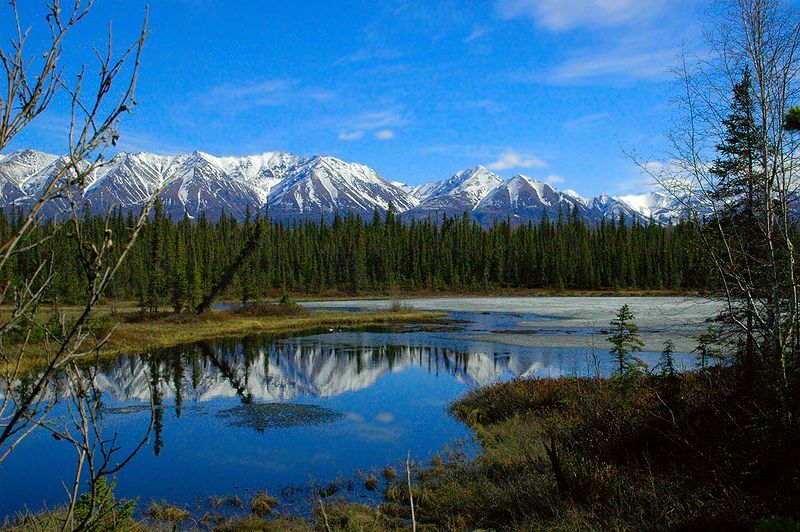 According to the National Park Service, the ideal way to check out Wrangell-St. Elias National Park is a one-week trip, but a three-day excursion there can still allow you to take in a lot. If you’re interested in the local wildlife, you’ll want to travel Nabesna Road, which ventures into the furthest areas of the park and offers spectacular camping and hiking. Originally built by the Alaska Road Commission to supply Nabesna Mine, the road is now a bit of an adventure, taking the brave to a wide variety of camping, hiking, fishing and hunting opportunities that can be found right along the side of the road. Some of the native wildlife includes Dall sheep, mountain goats, caribou, moose and bison. There’s also a multitude of black and brown bears. Since you have to cross streams at certain points, four-wheel drive is advisable if traveling beyond Mile 29. Also keep in mind that there are no gas or repair services available along this road, so be sure to fill ‘er up before venturing down it! If the native way of life is of more interest to you, you’ll want to stick to McCarthy Road. From there, you can explore a rural Alaskan town (if you’re really up for some Northern Exposure) and check out the Kennecott Mines National Historic Landmark. You know you’re in for an adventure when the National Park Service describes this road by saying, “Most two-wheel drive vehicles can make the trip without difficulty, but be sure to carry at least one spare tire and an adequate jack.” I’m all for adventures, but definitely take a page from the Boy Scouts for this outing and be prepared. Kennecott has two really fascinating aspects to it – it’s history as a copper ore mine and the mills in the town where the ore was processed. During the height of it’s operation, this little mining town in the middle of nowhere had it’s own hospital, school, skating rink, tennis court and dairy. That might not seem like much to us city dwellers, but as you visit this 300 person sized town in the middle of nowhere Alaska, you’ve got to be a little impressed by their skating rink, right? You can really get a feel of Kennecott from this collection of Ethel LeCount’s historic photos. From Kennecott, you can pick up the Root Glacier Trail, where you can check out a river of ice after an easy to moderate 4 mile hike. If you decide to walk out onto the ice, be aware that it is very slippery and crampons (spikey bottoms that you can attach to your shoes) are recommended. If you’re up for a challenge, a more difficult trail will take you to two mountainside mines – Bonanza and Jumbo. These are full day hikes and let you interact with a more untouched version of history. Also be aware that the mines and buildings have not been stabilized and you will be hiking in bear country, so take necessary precautions. Chitina Ranger Station is a great jumping off point to start your time in the Wrangell-St. Elias National Park. Open from May 23-September 1st, they have great native and wildlife exhibits, trip planning assistance and general information about the park. Known as the spot “where the rails meet the trails,” Chitina was a major transportation hub during the mining heyday of the early 20th century. The railroad hauled the copper ore from the Kennecott mines to Cordova, and Chitina was a midway stop along the route. As one of the two major roads leading into Wrangell-St Elias, it’s well worth a stop.